Bishnupur, a famous place for temples, crafts and culture, that not only attracts historians but art lovers too come to this place. It derives its name from Lord Vishnu and that is why its present name is Bishnupur also deriving from the fact that majority of the people who ruled belong to the ‘Vaishnava' sect. The place was also known by the name Mallabhum after the Mallas who ruled it for long. Famous terracotta temples during the 17th and 18th century were built during reign of Malla kings only under whose rule art and craft prospered. These temples represent classical Bengali style of architecture built during this period. Not only architecture but terracotta craft and Baluchari sarees made of tussar silk are also famous. Trains can be boarded either from Howrah and Santragachi. It takes 4 to 5 hours via bus which plies from Esplanade, Kolkata. One has to buy tickets for visiting sites of Bishnupur Rs 5 for Indian citizens and foreigners have to pay more. There are various lodges to stay there. 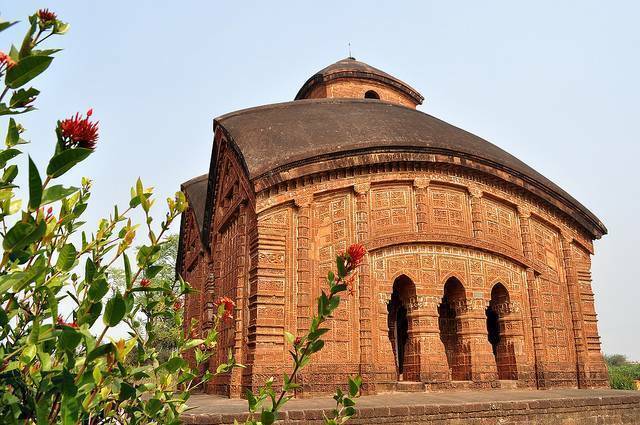 There are other places from Bishnupur that are also worth visit like Bahulara, Dihar, Jairambati, Susunia Pahar etc.